If there’s one thing Adam North and Melbourne have in common, it’s that they’re both famous for authentic, world-class food. So perhaps that’s why Melburnians just can’t get enough of the steak expert-turned- restauranteur, whose new Europe-inspired restaurant and bar, South Press Wine Bar, has been winning hearts (and taste buds) all across the city. Born and raised in Melbourne, Adam North has had a passion for quality food since his earliest days—and it clearly shows. In just ten years, Adam has grown his award- winning business, Hopkins River Beef, into one of the most respected suppliers of premium meat in Australia. In 2010, Hopkins River Beef was used by world-famous chef Gordon Ramsay in his Melbourne restaurant, Maze, and is today used by many other high-profile chefs including the well-known Guy Grossi. 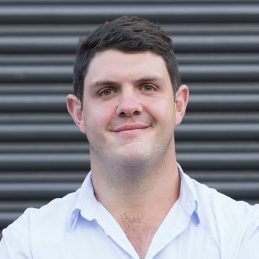 On top of being a successful restauranteur and business owner, Adam is also a recognised beef expert, as well as an industry advocate and public educator, sharing his passion and insight on all things food, farming and sustainability. The story behind the transition from passionate cattle farmers to marketers of Australia’s premier beef brand, as told by Adam, along with his broader entrepreneurial business interests has made Adam a highly sought-after keynote speaker. But when he’s not grilling up a storm or educating groups on sustainable farming, Adam is often busy working with big-name brands in the food industry. With his enticing mix of experience and expertise, Adam has been an obvious choice as ambassador for the likes of Treasury Wine Estates’ Pepperjack range– where he stirred a cult following after presenting the Facebook web series #SteakDiaries– as well as McCormicks Grill Mates range, and the inaugural Melbourne BBQ Festival. In addition to his ambassadorial roles, Adam also conducts popular barbecue masterclasses for audiences large and small. Adam’s classes cover everything from butchering to barbecuing, wine pairing, and specialised cuisines. Adam has also made several appearances in print, television and online— his larrikin charm proving a hit with audiences across the country. Of course, when he’s not doing all of the above, Adam’s insatiable appetite for all things gourmet sees him travelling the globe, building rapport with the world’s most revered foodies. At the same time, he can be found spreading the word about Australian produce, and extolling the virtues of all things homegrown. Adam is committed to delivering the world’s best produce to Australia, and similarly, championing local product to a global audience. Adam is also set for a burgeoning career in publishing, production and media respectively.